In recent years, the trend in fattening has been to work with larger herds and more spacious pens. Some of the reasons that have led to these changes have been an increase in the productivity of increasingly more professionalized farms, an improvement in housing conditions due to animal welfare issues and the development of feeding systems with the capacity for a larger number of animals. This is a new scenario that must be taken into account in the design of fattening barns and pen separations systems. 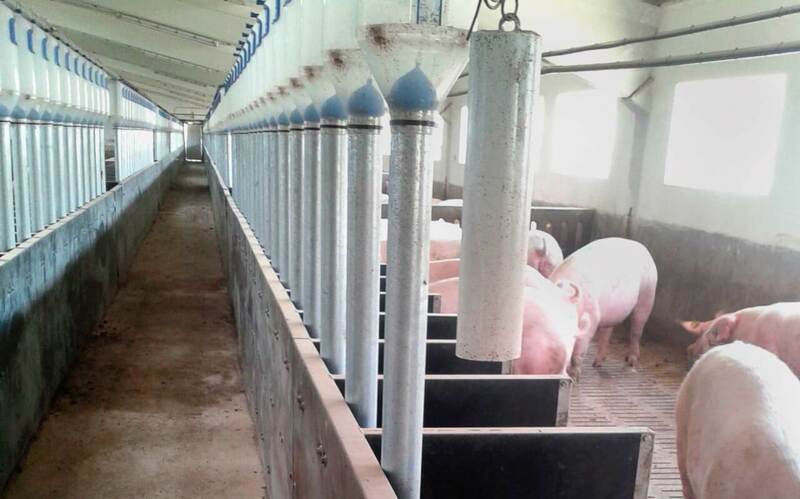 Regarding housing of pigs for breeding, the new European regulations on animal welfare, mandatory from January 2013, set out the need to build more spacious pens to create a comfortable environment and avoid stress among animals due to lack of space. Pens should also have a feeding area, a rest area and a defecation area. In terms of size, the regulation establishes a minimum space of 0.65 m2 per fattening pig of up to 110 kilos, and of 1 m2 per fattening of more than 110 kg. More spacious pens make it easier for the pigs to move more freely and develop more natural behaviour. On the other hand, working with large herds, of 15-20 pigs per pen, reduces fights, as a stable social hierarchy is not established. The partition panels used to separate pens are manufactured in different materials and are a basic item. Concrete, PVC, metal, plastic, etc. are some of the most used materials. However, their characteristics are different, so when choosing the material it is important to take into account such aspects as strength, durability, handling and ease of cleaning. Given the shortcomings identified in practice, such as excessive weight and the accumulation of dirt on concrete walls, or the problems with rust on metal partitions caused by slurry, plastic injected panels are the best option. They weigh less than other structures, which facilitates transportation, installation and handling. In addition, the possibility of bespoke measurements, as offered by Rotecna, allows the farmer to design pens to fit the size of their facilities. High resistance When we talk about housing in fattening we should also bear in mind that this stage starts with animals between 15 and 23 kilos, and ends with pigs reaching 105-120 kilos. Therefore, when constructing pens, the partitions have to be resistant to impact by large animals. Rotecna panels have an internal structure in the form of a grill, which facilitates homogeneous, stable and solid welding, thereby ensuring strong panels and guaranteeing high resistance. Hygiene Finally, it is essential to keep farms in optimal conditions in terms of health, as diseases can affect pigs in different ways, from death to slower growth. Hygiene is therefore another of the decisive factors to be taken into account in the design of a housing system for fattening. All-in-all-out management is of major importance to the proper cleaning and disinfection of facilities when switching herds, in order to avoid health problems. When fitting pens, the best option is to go for materials that are quick and easy to clean. Rotecna injected panels have smooth pore-less surfaces, which makes them very easy to clean and guarantees optimal hygiene, resulting in significant savings in time and water of around 30%-40%, which also reduces slurry production. Also note the resistance of the injected panel material to the different corrosive agents that can arise in fattening pens, from slurry to the products used to disinfect barns, thus guaranteeing greater durability. Rotecna made-to-measure panels Designed for group use in fattening and farrowing, Rotecna manufactures two different models of panels: blind and ventilated, available in different colours and a standard size of 1200x1000 mm However, in awareness that all not all facilities are the same, and that farmers have their own housing needs, Rotecna panels can be manufactured and supplied in any measurement ordered by the customer, while maintaining all the features and advantages.